Traditional Neighborhood Developments (TNDs) are the latest trend in residential and community homebuilding, an innovative vision to address the needs of those who are searching for a different way of life. 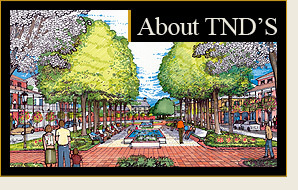 Designed to offer a better quality of life, TNDs are built upon very particular design parameters that are meant to foster closeness in spirit and community amongst the neighbors and business owners who live and work in this type of environment. One of the benefits of TNDs is that it allows developers to offer modern amenities and conveniences within homes and office areas to make living and working environments extremely convenient. However, a sense of closeness and community is still fostered by design elements that break down socially isolating boundaries found within typical suburban neighborhoods: welcoming porches on the front of all homes, garages positioned toward the back of homes with access granted through back alleyways, and wide, meandering sidewalks ideal for strolling. Adding in civic buildings, educational institutions, retail shops and parks allows the inhabitants of TNDs to participate in a lifestyle where they can walk more and interact with their neighbors and local business owners. Both public and private areas are carefully designed to offer enough privacy within a very defined area of space, yet also offer opportunities for social interaction within the community. This amazing culmination of public and private design principles, from pedestrian-friendly sidewalks and trails to the diverse population of homeowners is what gives TNDs such a strong community identity, as well as a sense of serenity that appeals to so many. Please click here to read about the planning principles unique to TND development, as well as a comparative overview of Traditional Neighborhood Developments vs Conventional Suburban Developments. Lastly, we have included a list of links to other TNDs from across the country.